Today we are peeking inside another well loved food blogger’s kitchen to see how she organizes and cooks daily in a small kitchen. For me, I believe that the kitchen is the hub of all family activity. It’s where my kids come to do homework. It’s where we meet each morning as they rub sleep from their eyes and sit to fill empty bellies. It’s where we come back together as a family at the end of the day. We spend more time in the kitchen than any other room in our home. Seeing as how important I saw this piece of the home, the open flow and updated cabinets sold me when we were buying the house. Still, open access to the dining room or not, the 70 square feet of kitchen space and cupboards does not give me a lot to work with in terms of equipment, appliance, and food storage for a family of six. We won’t even mention how much valuable storage space was sacrificed to open that kitchen-dining room wall. Perhaps if I didn’t cook three meals and a snack each day from the kitchen I wouldn’t see this as such an issue. I don’t want to sound ungrateful, and while my kitchen may be on the small side, it is definitely functional. Still, the care and feeding of six amplifies the kitchen’s compactness. Because of the lack of space in the kitchen itself, the nonexistent pantry, and the closet-less nature of our home, I’ve had to become a bit creative in how we store things. These are my tips on making a modest kitchen one that is inviting to cook in daily. Keep what you use daily in the space itself. This always seems like an obvious tip, but it sometimes is a bit more tricky than simply putting the pots and pans and spoons at arm’s length. For me, it means having all of my spices and oils and ingredients that I grab for at different times of the day right there next to me. This is no small feat. Considering my cupboard space for this is extremely limited, I am constantly reevaluating where best to store snacks for the kids’ lunches, different oils and vinegars, and oft-used flours and dry ingredients. We have one large cupboard that holds all the pots and pans, the mixing bowls, a selection of thin cutting boards, cooling racks, colanders, and liquid measuring cups. It is like a game of Tetris to make it all fit, and each item has a specific home, but having them in the kitchen is so much better than putting them in my backup storage spaces (the garage and the basement). I keep larger roasting pans and unruly items in both of those places, but the daily use items are finagled into their home each day. I mentioned the lack of closets in my home (I mean, where did they hang coats and store their boots?) earlier. Because closet space seems like the obvious choice to transition into pantry areas or extra kitchen storage and I am already short on it, I needed to create my own space. The first item to do so was a wire rack that holds my beloved stand mixer, a wok, our toaster, a few bottles of wine, hangs all the tongs, potato masher, and larger kitchen utensils, and also hangs a bunch of bananas now and again. It’s a bit utilitarian, but it is thin, pushes up nicely against the wall in the dining room, and provides a bit of extra storage for a few more things I want to keep close that I couldn’t fit in the main kitchen area. Above the wire rack are shelves chosen to match the kitchen cupboards, which used to house extra dishes, but now hold baskets full of kitchen linens. With no linen closet or drawer space for these, the baskets (a simple collection from around the house) help keep them organized and together. I also recently added an extra long cupboard unit that sits below the dining room window and a bookshelf to keep some of my cookbooks in from the damp garage and basement. This has proven to be a sanity saver for housing dishes and serving items without having them collect dust and then require to be washed before each use when they were in the garage. 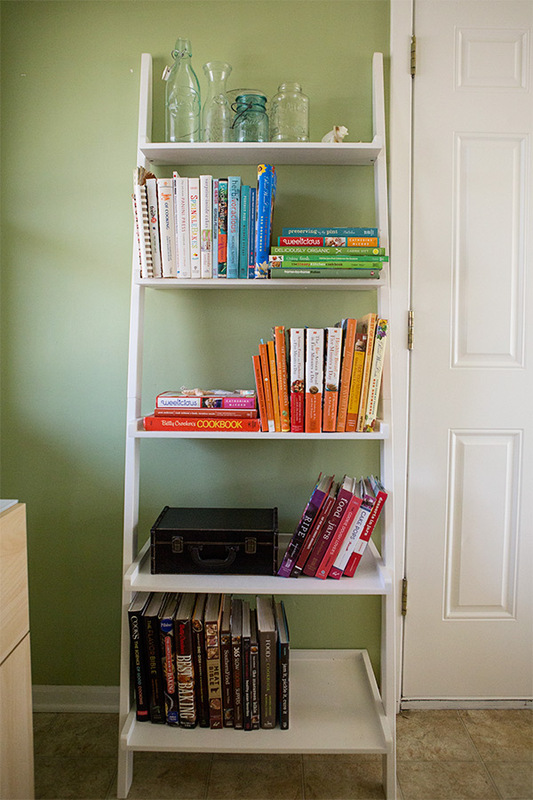 Plus, I like seeing a few of the cookbooks I own put to proper use just because they’re more accessible. While they aren’t in the kitchen proper, around the corner is better than outside or downstairs. Use jars and other containers to store food. For some reason, I am always resistant to this, but the minute I remove dry goods from their containers and place them in see-through glass jars or other containers I revel in the beauty and simplicity of it. 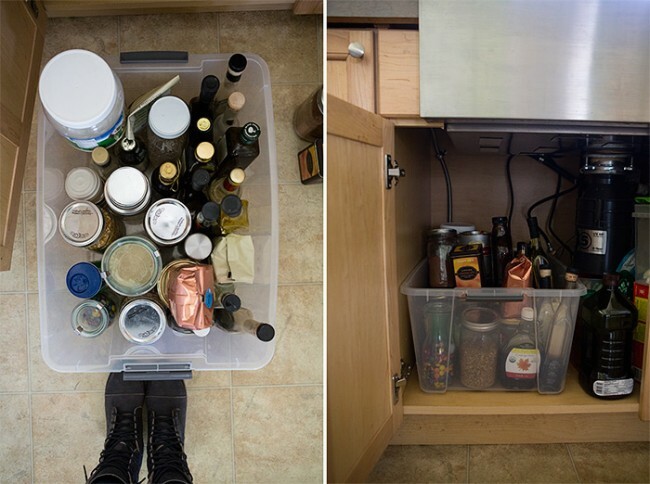 Too often we keep bulky, unnecessary packaging around, and it creates cramped cupboards. When cupboard space is at a premium, a few extra inches here and there really helps make food more accessible and gives it a bit more room to breathe. Any space is usable space, even the most unlikely areas. I recently expanded our cupboard space to include the space beneath the sink. The right side holds a bucket filled with scrub brushes and sponges, a few cleaning supplies like dish detergent and extra hand soap, and the left side has become a catchall for some items I was continuously carrying up from the basement or retrieving in the garage only to leave them on the counter because I knew I’d need them again soon. We used a large plastic tote (currently without a lid) to keep all the food items separate from everything else. 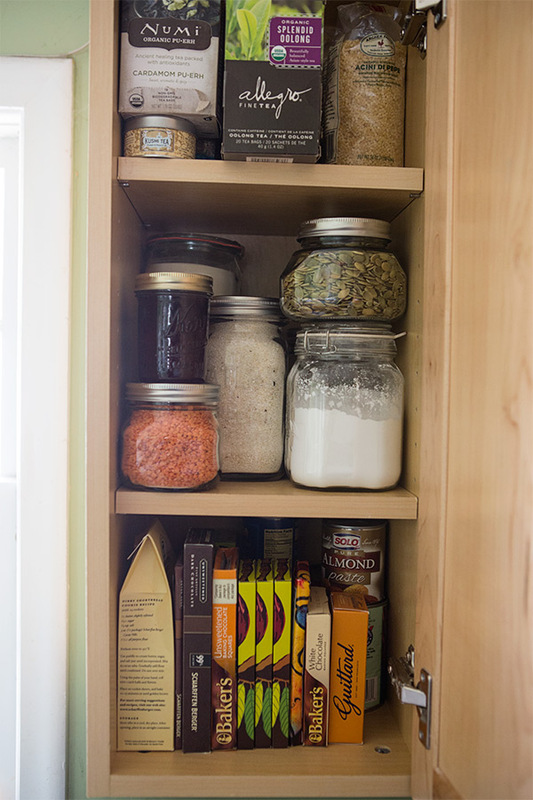 I use quart-sized jars to try to create some sense of order to the space, but it houses everything from sunflower seeds and pepitas for school lunches to popcorn kernels and a collection of vinegars and oils. There are larger bags of salt, cocoa powder that won’t fit in the spice cupboard, and a few other odds and ends as well. It might not be perfect, but it’s better than the cluttered counter I was dealing with before. Plastic totes are your best friends. When I first started moving things to the garage and the basement I wasn’t thrilled with the idea of housing food and the equipment I use to make food there. Old house, old basement, old garage. I won’t go on. However, several racks of metal shelving and numerous plastic totes later, these spaces do a fine job of keeping my kitchen overflow clean and dry and organized. Everything from almond flour and dry beans to my rice cooker and food processor live and are used under these conditions. It makes it easy to grab the tote and carry it back to the kitchen and then pack it up later, too. Kiss your husband daily for giving up his garage space. This is especially important when you have a handy husband who would love nothing more than to use the entire one-car garage stall for a workbench and tools. Until we are ready to expand our footprint, we have to coexist for our mutual benefit, and it never hurts to remind him that you’re grateful for the cabinets and cupboards you get to only after stepping over a rotary saw and navigating his motorcycle. Use a rolling rack or a small cart for portable kitchen storage. 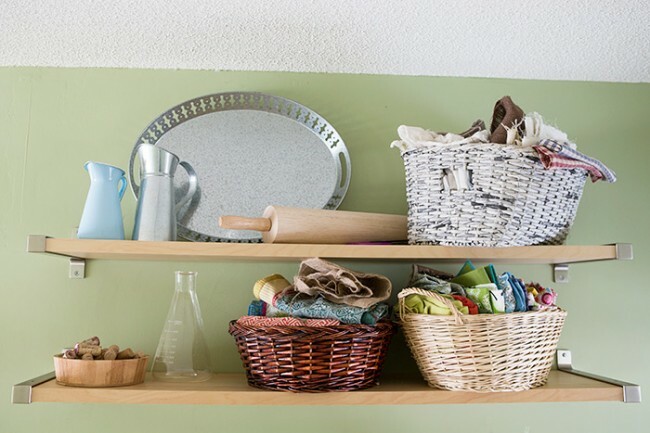 Hang pots and pans on a wall, a pegboard, or off a pot rack over the sink and stove. Place hooks inside cupboard doors to hold potholders or dish gloves. Get a wall organizer to hold mail and keep counters clean. Install rolling shelf organizers to make reaching the back of shelves easy, and allowing you to better use that space. Group like foods and like kitchen tools in the cupboards to make them easy to find. 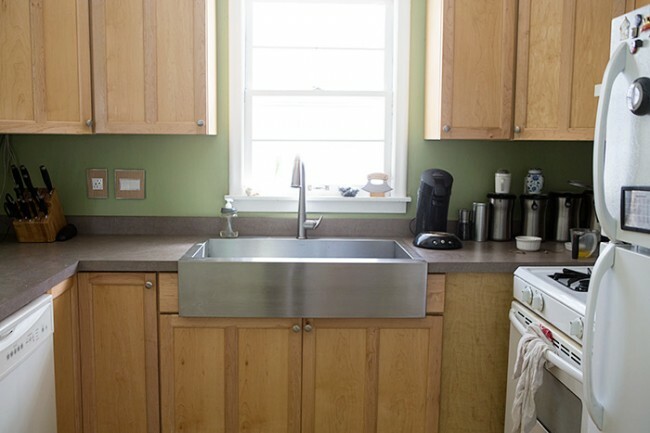 Make an over-the-sink or over-the-burners cutting board to extend counter space. What it really comes down to for me is how I use this space to involve my family in the making of our daily meals. It’s the ability for my kids to pull chairs to the counter and crack eggs and knead dough with me. If it is a space that feeds us and is filled with laughter and the chatter of small voices, then it is doing its job. When the space becomes stressful and stifling (perhaps because everything we need is on the other side of the house or another floor), then I know I need to make a change. Like any part of the home, this balance ebbs and flows with the seasons and my children’s ages, but we always come back here to be fed. 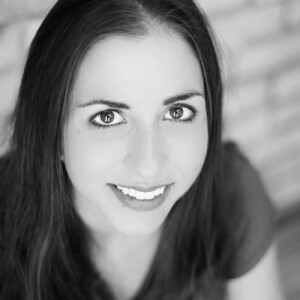 Shaina Olmanson is the freelance writer, photographer, and home cook behind Food for My Family. 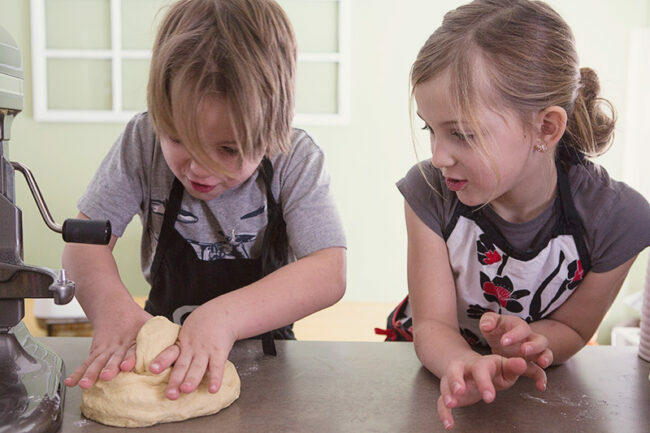 Cooking daily with and for her four kids and husband, Ole, drives her desire to inspire other families to do the same. She believes life exists in the small bits and simple moments shared: the way the room brightens with the fresh, bursting scent of citrus being peeled by a small child’s hands, exploring the sidewalk after a hard rain, the sharp tang of minced garlic hitting hot oil in a pan. Food for My Family has been named one of the Top 100 Mom Food Blogs by Babble.com for the past four years. Shaina is the author of Desserts in Jars: 50 Sweet Treats that Shine, has served as the food editor for Lifetime Moms, and contributes regularly to a variety of online sites and traditional print magazines. She lives in the Twin Cities of Minnesota, an urban oasis surrounded by farms and fields of green. Shaina great tips! I have a ton of jars in storage and need to use them for storing food. Thanks for the tips! I also live in an old house with a smaller kitchen. I keep less frequently used items in the basement. Glad to know someone else does too since my sister thought it was pretty funny! Our kitchen is even tinier, we rent and the oven is old but still works. The dishwasher is ancient and we use it store pots and pans…but I need to weed them out since I use mostly cast iron skillets. I find a way to cook just about every day, it’s hard work but worth it. We use hanging baskets for snacks and dish towels and rags. I have a rolling cart for rags, and dry goods. Karen, I can definitely relate. We had a rental before this that was essentially a tiny refrigerator, stove, sink, and 14″ of counter. You definitely have to get creative when dealing with small spaces. Rolling carts and hanging baskets really help add surface area and storage to those teeny places. Glad to hear you’re making it work. It’s true what they say – good things can be found in small packages. 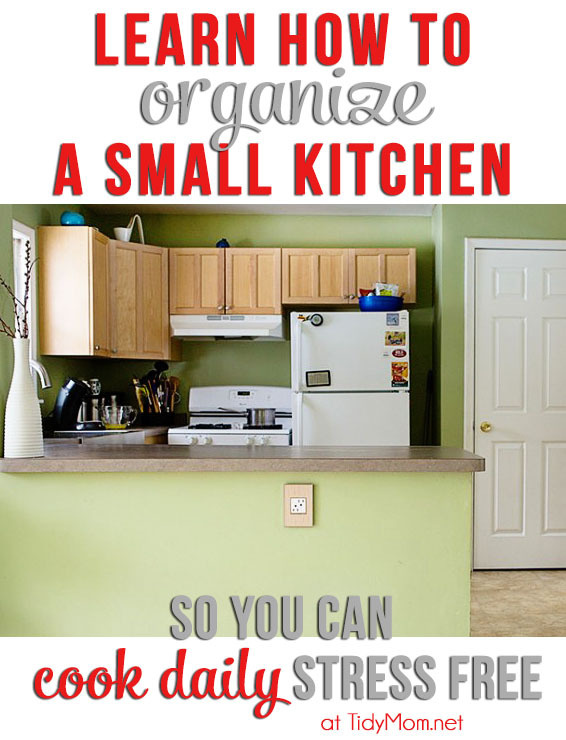 Love these small kitchen tips! 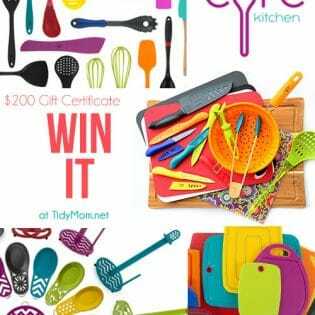 Pingback: The Organically Clean Home, Toy Organization, Small Kitchen Tips + more! Finding xbox 360 homebrew games can be a real task. and you would wonder how you ever got by without them. I wish we had a garage for extra storage. Thanks for the jar idea. I will be using that tip. Thanks. I never realized how spoiled I was on kitchen space until we sold our house and moved our family of 4 into an RV! 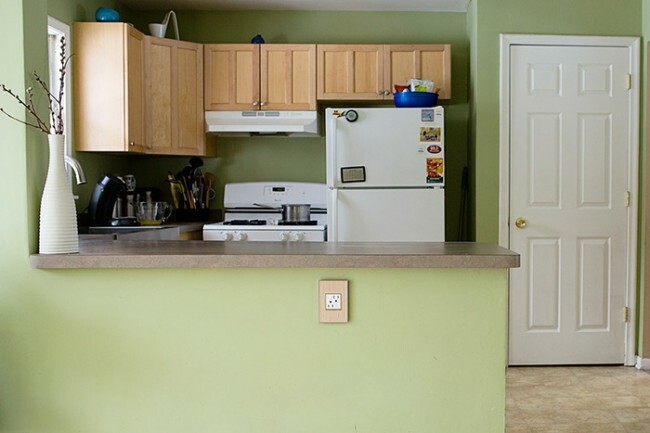 Our entire living space is 429 sq ft, so you can imagine how tiny the kitchen is. Like you, I also found that utilizing “dead space” is a must. 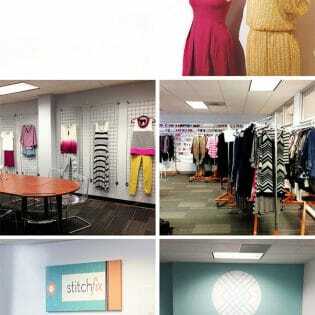 I have things hanging everywhere! The thing I miss the most, though, is a garbage disposal. Go figure. Don’t mind washing dishes in a teeny sink, but hate that drain stopper! I absolutely LOVE the under the sink idea! I wanted deep shelves in my pantry, but my husband and dad decided 12″ was deep enough. Wrong! So now I have things that are too wide for my pantry. at least one or two of them will fit NICELY under the sink. As you mentioned that cooking in a small kitchen means that one should have most ingredients at hand’s reach and pots and pans at a nearby cupboard, it reminded me of something. My mother just moved into her new house that featured a small kitchen and I wanted to give her a housewarming gift. Would a steel cookware set be a good idea?